Do you own a white or light color car? 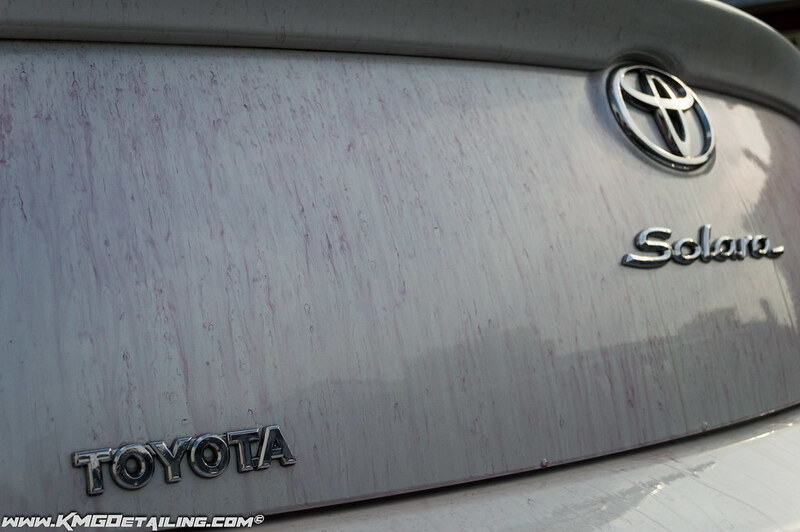 Have you noticed small orange or rust colored spots on the paint that you couldn’t remove? Those spots are iron deposits that have become embedded into the finish of your vehicle, which are not easily removed. This is very common on vehicles that have performance brake setups or aftermarket high performance exhaust systems on them. It is also somewhat common on brand new cars that have been delivered by train due to being exposed to rail dust during transport. This is where a product such as Carpro’s Iron X comes into play. Iron X is a power product that dissolves iron particles and other surface contaminants for safe removal. If you need the most effective exterior cleaner on the market the CarPro Iron X Iron Remover is the product you simply must have! With one quick treatment you can remove the vast majority of contaminants on your vehicle’s exterior surfaces with little to no work. This gentle formula is pH neutral yet incredibly effective at removing build ups even the naked eye can’t see. Mist it on the paint, wait 5 minutes and wipe it with a damp sponge or skip the sponge and move on to a thorough rinsing. Upon completion you’ll be stunned at how much has been removed with so little effort. It can reduce the amount of contaminants your clay bar can remove by as much as 80%. This will save you a ton of time in the clay bar process and enhance the results from your polish, glaze, sealant and wax used afterward. The improved formula also has a cherry scent now! So stop using multiple products to achieve mediocre results, pick up the Iron X today you will love it! To use this product, we first recommend washing the vehicle to remove the loose particles. With the vehicle cool to the touch and in the shade shake the bottle thoroughly and mist it on the exterior of your vehicle. We target the wheels and exterior painted sections as that is where it’s most effective. It’s designed to be safe on all trim and the rest of the exterior but with any new chemical you can do a test spot if you want to be certain. Wait five minutes and wipe the area down with a damp sponge and you’ll see the formula turn to a deep and dark red/purple color. After that you can remove it with a damp cloth or thoroughly rinse the vehicle down and you are done. The surface should look and feel much cleaner now! Tips: Do not let the product fully dry on the surface when possible and make sure you avoid direct sun during the process. Avoid spraying brake calipers and work in a well ventilated area. We recommend wearing rubber gloves and washing your hands right after to be safe. Average usage for an average size car is about 100 – 150 ml for a full cleaning. Iron X has to be one of the worst smelling products that you will ever buy, however the cleaning power it packs certainly offsets dealing with the unpleasant smell. This is a product that you certainly do not want to open in your home or you will be in trouble with your wife for quite a while. 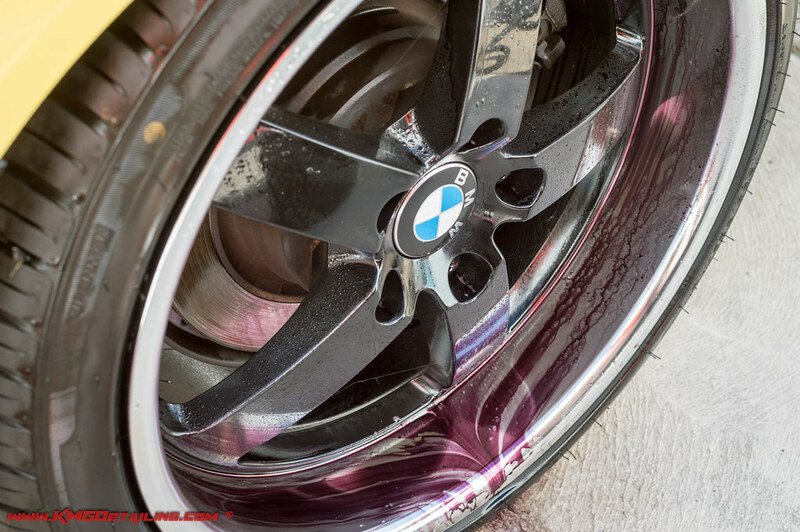 Iron X is very easy to use on wheels or paint, you simply mist the product on and let it sit for a few minutes. The product will be clear when you apply it, however as it begins to treat the contaminates on the surface the liquid will turn a deep purplish or blood color as shown in the pictures above and below. You will want to be certain that the surface is cool before using this product and you do not want it drying on the surface as well. 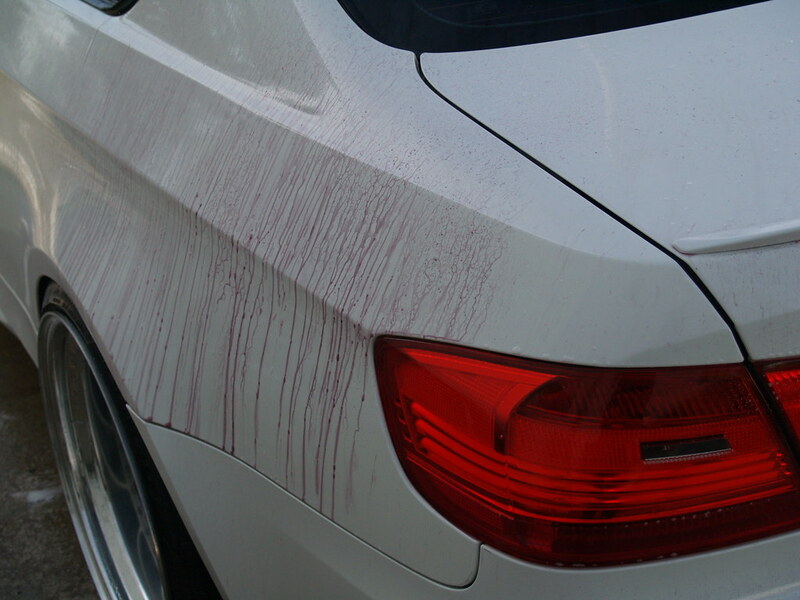 Here is a picture of Iron X on a 2008 BMW M3. I typically use the product after completing my 2-bucket method wash, and after sitting for a few minutes will go around the vehicle one more time using my wash mitt before rinsing the vehicle very thoroughly. This is not a product you need to use with every wash, however it is something that you should probably use 2-3 times per year to maintain a nice clean contaminate free finish. I do however find myself reaching for Iron X quite a bit for cleaning wheels as it is very effective and works quickly to remove brake dust and other contaminates. Here is a quick video I shot showing just how quickly the product begins to react with contaminates on the surface of a wheel. Great write up Kevin. I have to agree with you on ironx being a great product. I myself use the lemon scented version. I will have to try this version just to see how it smells compared to the lemon scent. I have used a couple other iron removers and Ironx is still the best one. Thanks Mike, and I agree that this is the best Iron Remover product on the market that I have used. I have also used the Lemon scent in the past and typically I jump back and forth between the two. You can’t go wrong with either one, as in the end they both still stink. Great article Kevin. I enjoy using this product to show folks what really is attached to their vehicle. The “bleeding” just wows folks. Thanks for the article. Scary question to ask on here. Is there a big difference between this product and the way it’s used, compared to say an “acid bath” at the dealership? Seems to me they both are used for the same purpose, and deliver similar results. I personally use Acid diluted 4:1 on wheels and paint work, mostly on white cars to help bring out that bright white look once again. Zach you are comparing to totally different products. Iron X is safe for use on pretty much all surfaces, while acid can cause some serious damage to certain types of material. I use Wheel acids on certain types of wheels (chrome or coated wheels), however I really do not use acid on paint. I do know plenty of dealer volume guys that use this method however, as it is a quick way to clean the surface but you can also effect other items such as trim. Hopefully this answers your question. Is Iron X safe on a car that has clear bra ? 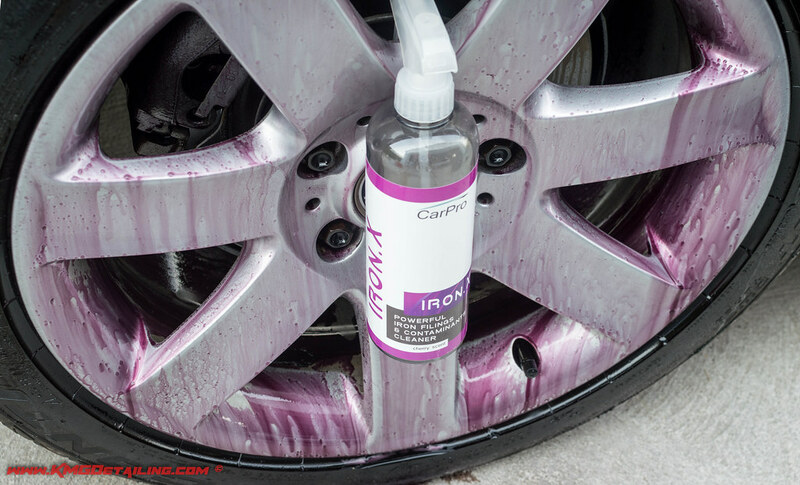 Can I use CarPro Iron X Iron Remover over ceramic coating? Ivan, yes you are safe to use this product over a ceramic coating.